And found My First True Love! In the summer of 1966 I fell in Love…with France. I was 18 years old, and just graduated from High School. I sold my 1957 Turquoise Chevy Convertible to get there, and with my parents permission, I traveled with a girlfriend to Europe. We went to all of the beautiful countries that summer, from the UK TO ITALY. When we arrived in PARIS France my heart melted, I was forever changed and not unlike many young artists of my day, I felt the strong pull to move there and begin my adult life, become fluent in French and become a famous artist. My alter ego Collette was created, and she yearned for her French Girl life. However fate had another path planned for me, so my life in France began much later in life. College, Marriage , A Creative Career and Raising Twins became my first life, one full of joy, love and art. Not a bad life at all … only different. My love never waned for France it only grew stronger, however, it would be many years before I could return to my beloved France to search for my personal village, a perfect cottage with an art studio attached and the life I was destined to live. 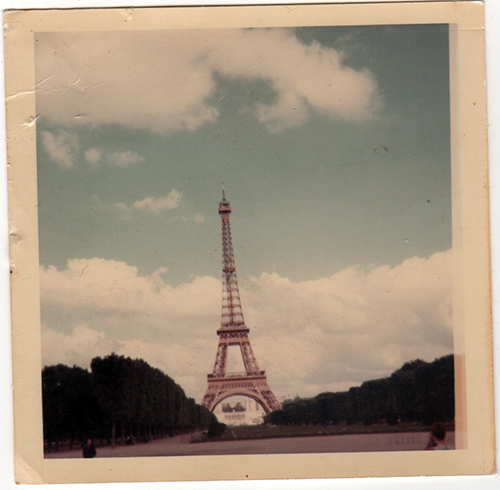 Paris was always the starting point to every visit in the early days of my second version of my dream life. The excitement into seeing the Eiffel Tower from the window of my plane always made my heart pound and still does. But as I grew more curious of the small villages, towns, and the people throughout France, I began to venture to other regions finding some of the best surprises of new areas in the countryside. The Region of Aquitaine and the department Lot et Garrone was one of the first I visited. It was there I found the village of Roquecor, surrounded by farmland, and where I rented my first art studio for several years. Each year I returned to that studio to find my art voice and my adventures are well documented here in my first travel blog L’ARTISTE CARTE POSTALE which I began to post in 2006. 12 years later, I’m still traveling and blogging about it… I hope you will join me to continue my journey through France thru the eyes of an Artist, and that it will inspire you to follow your dreams.